How easily can you build apps with Salesforce? Take a quick look. 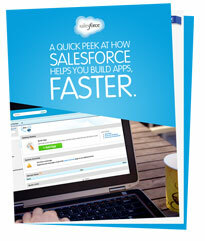 Build apps easily with Salesforce. Learn about the Salesforce Platform Mobile Services and how to architect, develop, and manage mobile applications for the cloud. Salesforce1 Platform offers tools like Force.com to make building apps not only easy, but faster. So you can spend more time innovating on the kind of apps that will drive business forward, instead of trying to figure out how to create what you want.